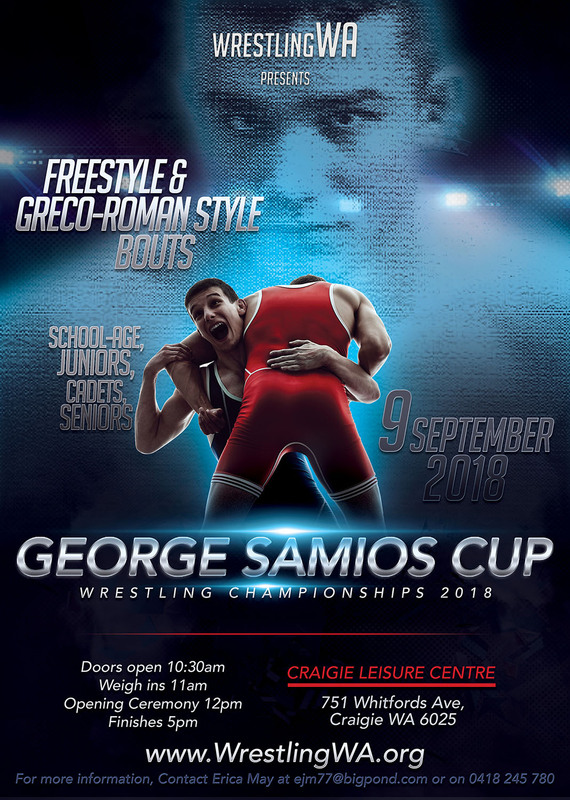 The ‘George Samios Cup’ 2018 competition is an open event. Any individual that is a financial member of Wrestling Western Australia (WWA) and Wrestling Australia Inc. (WAI) can enter. Weight classes (see table below) – 2kg weight tolerance allowed over the displayed weight-age categories. Greco-Roman is permitted for males who are over 18 years old on the day of competition. Please ensure that you enter the correct weight categories with registration for the comp as confirmed with your coach. No shifting of category or late entry will be considered on the day of the competition. If a wrestler does not make weight he/she will forfeit their matches and will only be allowed exhibition matches if and when available. Please note weight categories have been updated to reflect UWW categories. For Wrestling Clubs competing for the Peter Lawson Memorial Trophy, any registered entry that fails to show up on the day of the competition will cost his/her club 2 points. Wrestlers (or an adult their behalf where the wrestler is a < 18 yrs old) must register online. Registration Deadline: Registration fee of $25 will be accepted until 5pm on 31 August 2018. Late Registration Deadline: Final Registration fee of $35 will be accepted until 11:59pm on 4 September 2018. No registrations will be accepted after this time. The event is organized and run by volunteers who operate in their free time to make it possible. Please respect this contribution by registering well before the cutoff time. Competition fees apply for each weight-age a wrestler wants to wrestle in (for example, if a wrestler wants to enter Junior and Senior, Freestyle and Greco-Roman competitions, then he/she must register and pay for each category – in this example, $25 X 4=$50). WWA Membership – All competitors must be 2018 WWA members (i.e., 2018 WWA Memberships fees paid for each Individual or Family memberships, and the WWA Membership Registered or Renewed online for review and approval by WWA Board). WAI membership is included in WWA membership fees. Annual WWA Membership fees: Individual Membership is $45, Family Membership is $80. Membership fees should be paid online. Medals for 1st, 2nd and 3rd. All volunteers and tournament staff arrive. Please note: any wrestler who has not weighed in prior to 11.45am will forfeit their position in the competition. They may be eligible for exhibition matches if available. The tournament will be conducted under double-elimination line-bracketing rules where there are more than 5 competitors. This means that all those who lose one (1) match in the championship bracket (A) may be sent into the repêchage bracket (B) for a chance to compete for the bronze medal. Those who lose two (2) matches are eliminated from competition. All competitors are responsible for their own medical and physical fitness to wrestle and understand that the nature of the sport of wrestling involves some physical risks that can result in serious injury or death. All participants must adhere to the WWA Code of Conduct, Member Protection Policy and WAI Anti-Match Fixing Policy. The organizer has the right to disqualify competitors from competition in the event of rule or code of conduct breaches. The weight shown on the weighing scales at the time of the scheduled weigh in will be regarded as the official weight. Any weight check performed by an athlete prior to the official weigh in shall not be permitted to form the basis of a challenge to the official weigh in.